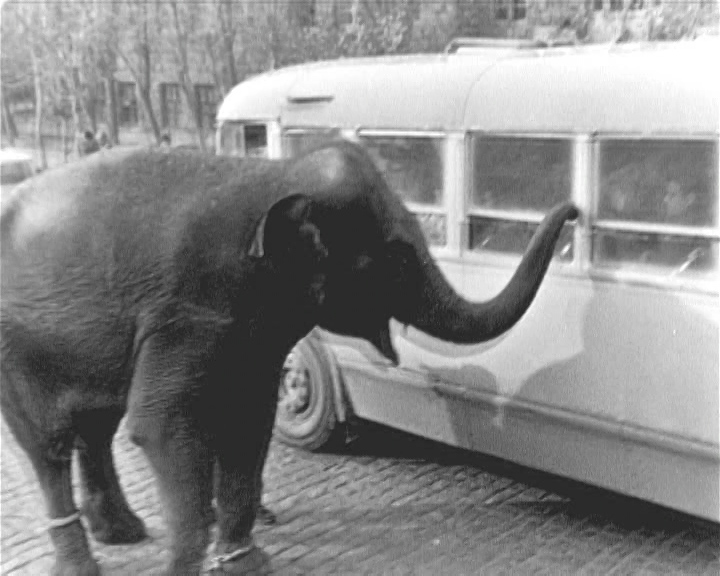 The film depicts an elephant that passed through a big city, Yerevan, from the railway platform to a zoo cell. Born 1938, Yerevan, Armenia. In 1959 Hovhannisyan graduated from the Directing Department of Yerevan Fine Arts and Theatre Institute and since then he worked at Hayfilm Studio. In the period of 1966-67 he was a director-practitioner at the shootings of Yuly Raizman's Your Contemporary. A Meeting at an Exhibition (1968, short), Attention, It Is Raizman Shooting! (1969, doc. ), Watch Out, an Animal! (1969, doc. ), Panos the Clumsy (1969), Avetik Isahakyan (1971, doc. ), A Meeting with Professor Badalyan (1972, doc. ), An Hour Before the Dawn (1973, co-dir. : Erazm Karamyan), A Bride from the North (1975), Cooks Arrived for Competition (1977), The Flight Starts from the Earth (1980), Mechanics of Happiness (1982), Hosted by the Commander (1985), Strange Games (1986).